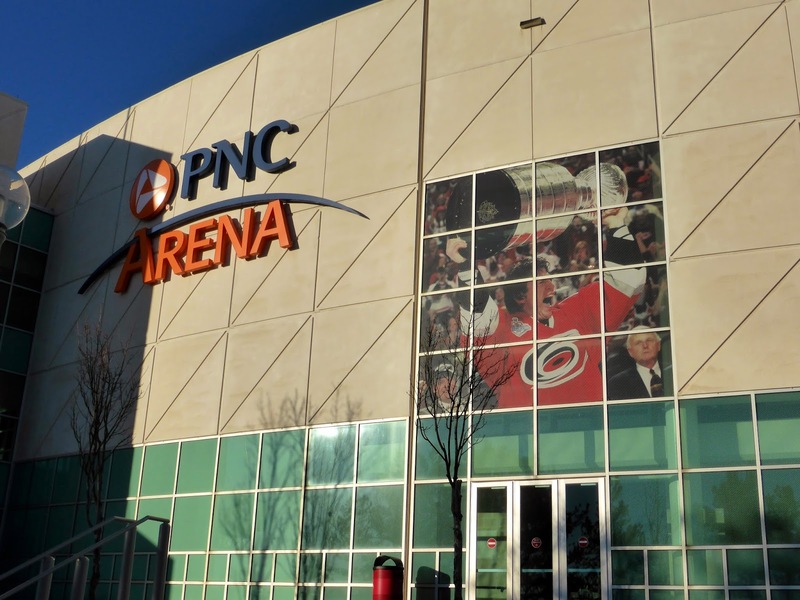 In 1997, the Hartford Whalers moved to Greensboro, NC where they played for two years before settling permanently in Raleigh, the state capital and a town known far more for college hoops than ice hockey. 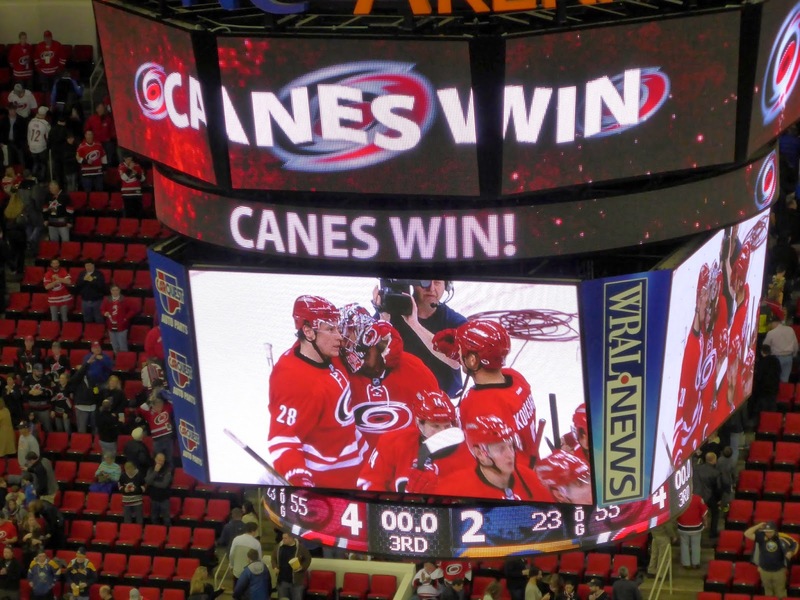 The newly-renamed Carolina Hurricanes stuck it out though, beating Toronto to make the Stanley Cup Final in 2002 and winning the Cup in 2006, the first year after the entire 2004-05 season was cancelled. Those successes have enabled the 'Canes to reach a level of stability despite missing the playoffs 6 of the past 7 seasons. 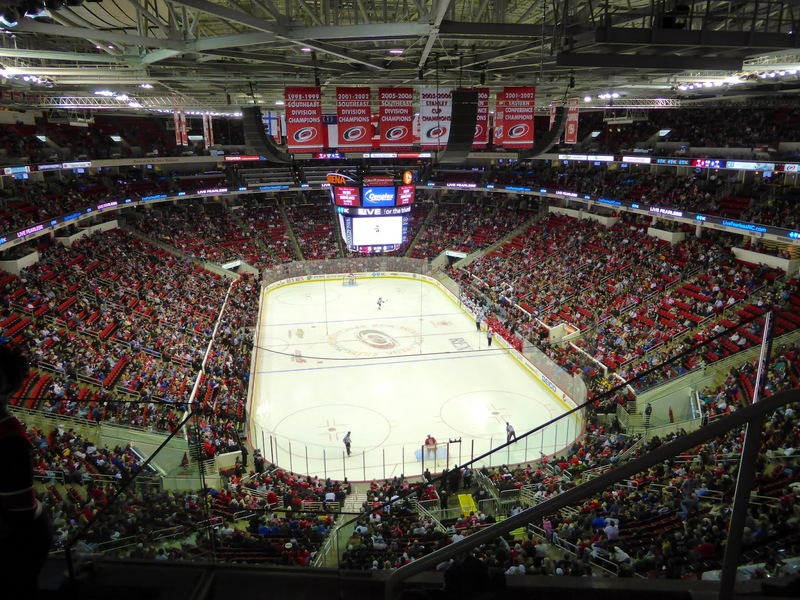 The Hurricanes play in PNC Arena, which was known as the RBC Center from 2000-2012. 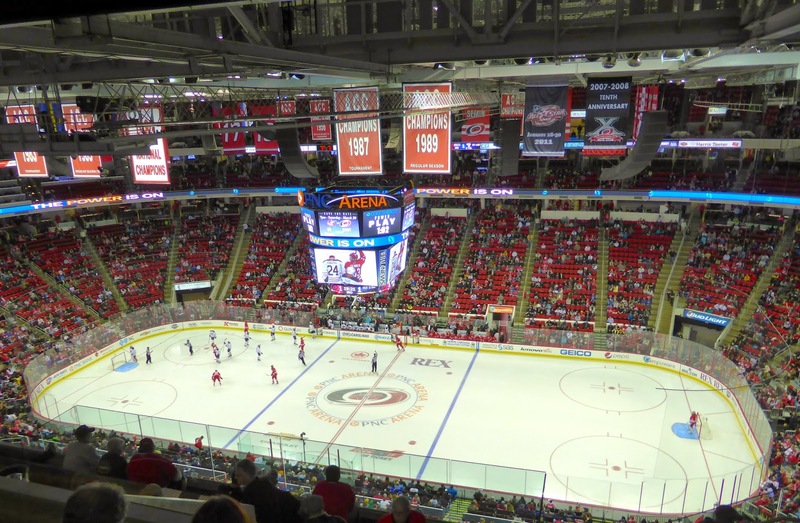 For me, it was the last NHL venue that I needed to visit to complete my goal of seeing a game in all 30 active rinks. Even better, two friends who had lived in both Japan and Singapore recently relocated to the Raleigh area, allowing me to reconnect with them at the same time. Nothing like completing the NHL rinks and celebrating with old chums, including Sharpy, who had joined me on the trip. 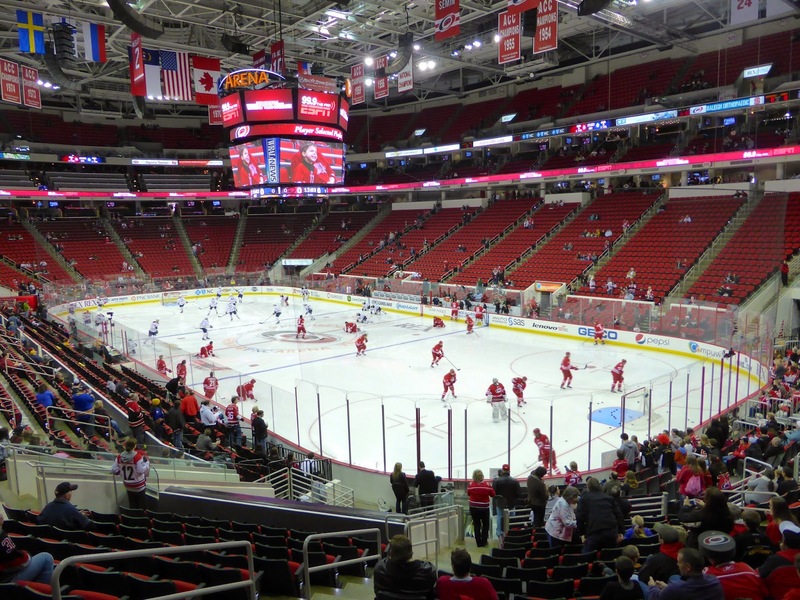 My friends actually live in Cary, just 5 miles from the arena, which is located on the western edge of Raleigh. The rink is only accessible by car, with parking a rather unreasonable $15. I try my best to avoid giving the NHL any of my money, but that goal was impossible to achieve here; there is no public transportation to the arena. Fortunately, tickets here are very cheap on the secondary market, especially with the last-place Sabres in town. I picked up a couple of upper deck seats for $12, and even those were overpriced. They were the first row above the stairs coming out of the and the glass blocked a bit of the ice, rather annoying when the play is in that corner, as you can see below. Those might be the only negative things I found here. 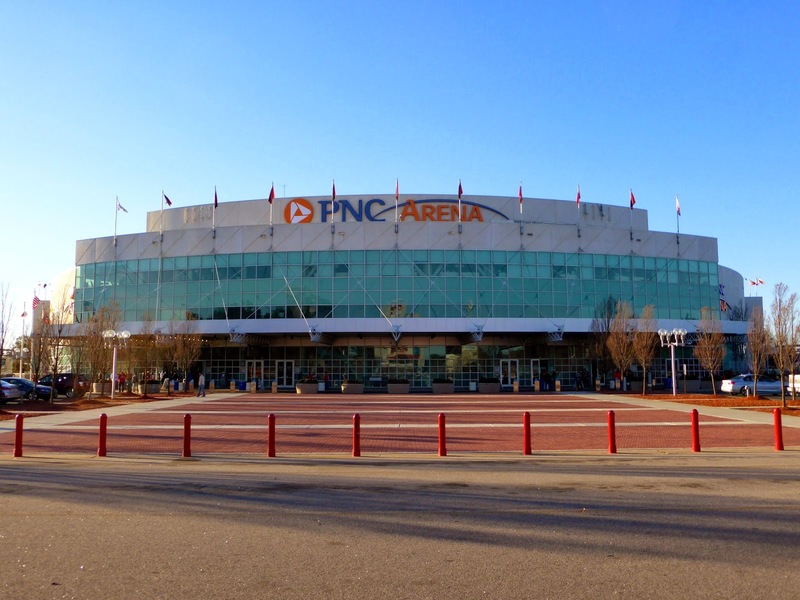 First, the building also hosts NC State Wolfpack basketball, which has a storied history, including two NCAA Championships. 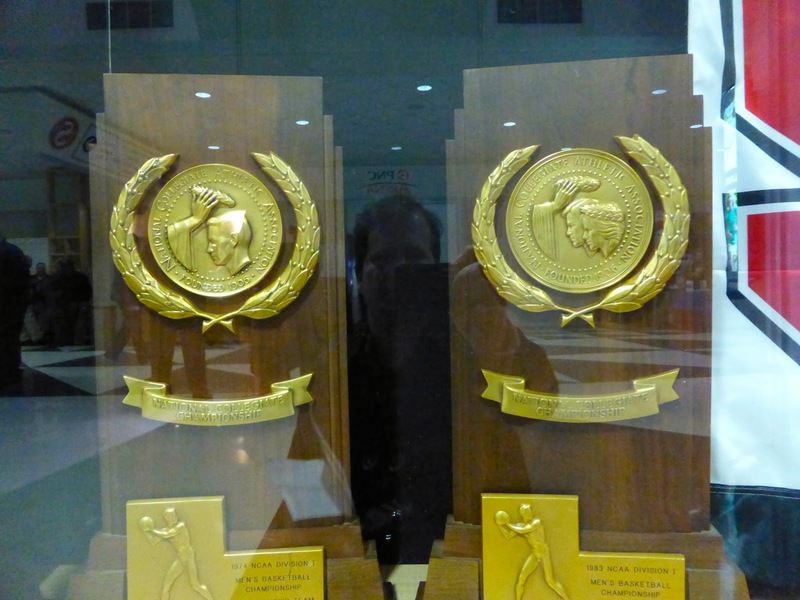 I love trophies (below), and having these on display makes the arena rather unique among NHL venues. There are also dozens of banners for honoured players and success in the NCAA tournament in the rafters, making this a great place to visit if you enjoy seeing history on display. Before the game, you can walk around the lower bowl during the warmups, but the good seats along both sides are reserved. Called "Priority", they are inaccessible to those without tickets, so you are forced to watch the skate around from the corner or end zone. In the third period, I moved to the top row along the side and found this a better seat. First, there are giant TVs that show the game live, so you get all replays (as well as NC State basketball during the intermission). Secondly, there is no netting to disrupt the view. I know the netting is essential to protect fans behind the nets, but I find it at time to be a distraction, particularly when taking photos. One thing I found interesting was the collection of all 30 team logos along the upper concourse. They are in alphabetical order mostly, except for Winnipeg. Obviously Atlanta used to be there and rather than shift 28 logos, they just replaced the Thrashers' logo with that of the Jets. The Sabres started Michal Neuvirth (above), who had been acquired a week ago from Washington for Jaroslav Halak, who didn't even suit up for them. Cam Ward was between the pipes for Carolina, coming off a strong performance against the Rangers just two days before. 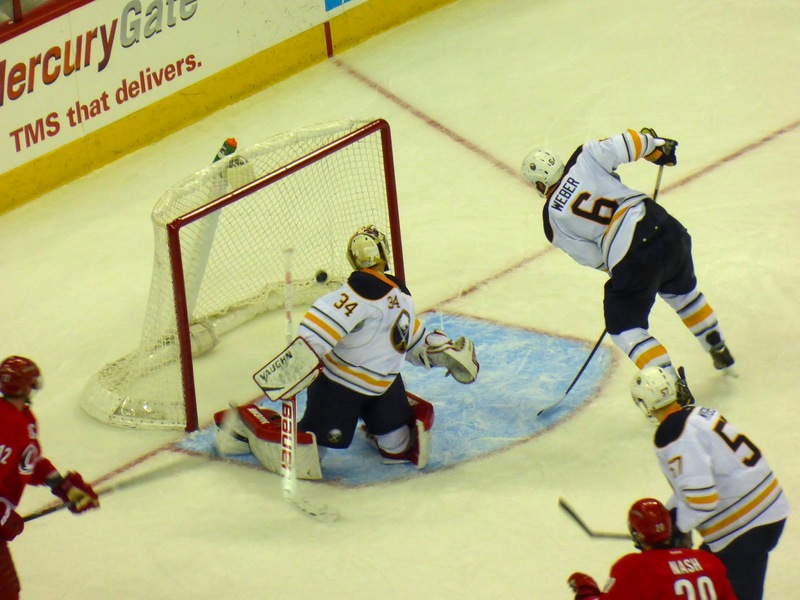 The Sabres opened the scoring when Tyler Ennis (#63 above, cut in half) was hooked on a breakaway and awarded a penalty shot, which he converted by beating Ward up high. 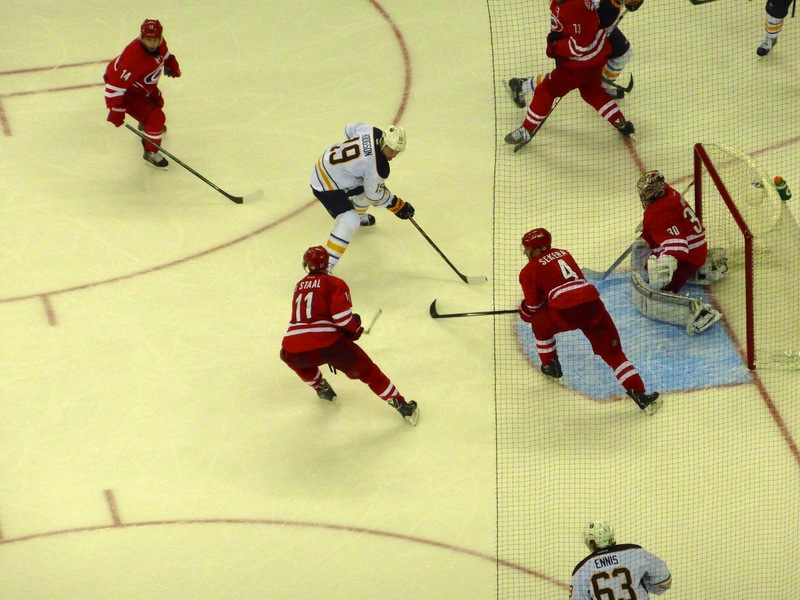 Three minutes later, Jeff Skinner (below in warmups) beat Neuvirth from a seemingly impossible angle to tie the game. The second period was dominated by the Hurricanes, who peppered Neuvirth with 22 shots, yet not a single one got into the net. 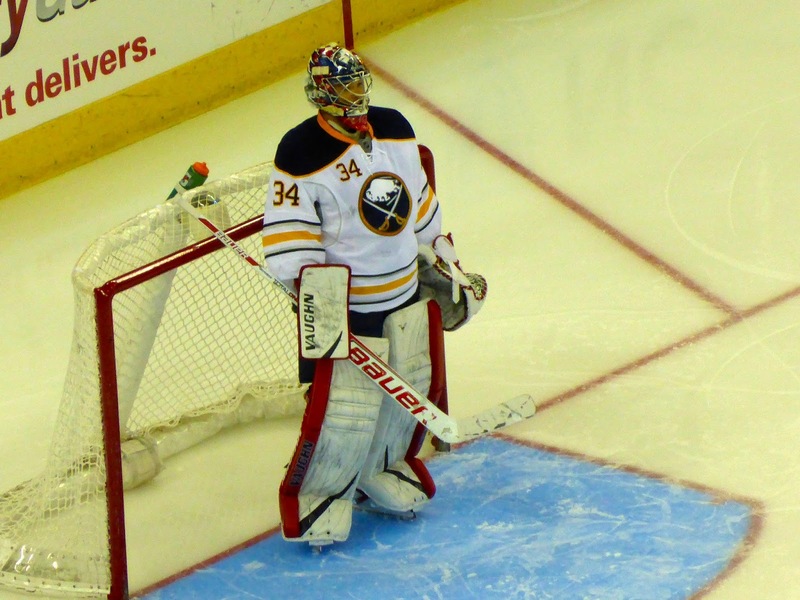 It was an incredible display by Neuvirth as he tries to help Sabres's supporters forget about Ryan Miller. In the third, Carolina continued to shoot at will, but Buffalo scored against the run of play when Drew Stafford had the puck find him next to an open net. Shortly thereafter, Buffalo took a penalty and Carolina capitalized when a shot by Alexander Semin went in off Mike Weber's skate (below). 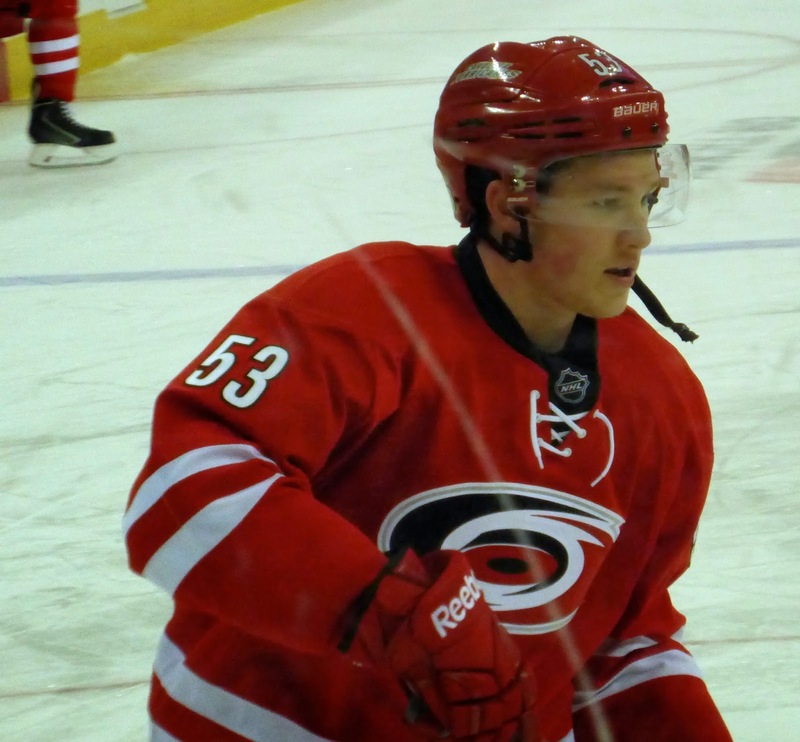 This got the Hurricanes going and just a few minutes later, Semin found Jiri Tlusty at the right face-off circle and Tlusty beat Neuvirth with a wicked wrist shot to give the home team their first lead of the evening. Buffalo really didn't challenge after that, and an empty netter by ex-Sabre Nathan Gerbe clinched the game. Carolina finished with 55 shots but Neuvirth was quite strong in turning aside 51 of them, making a few spectacular saves along the way. 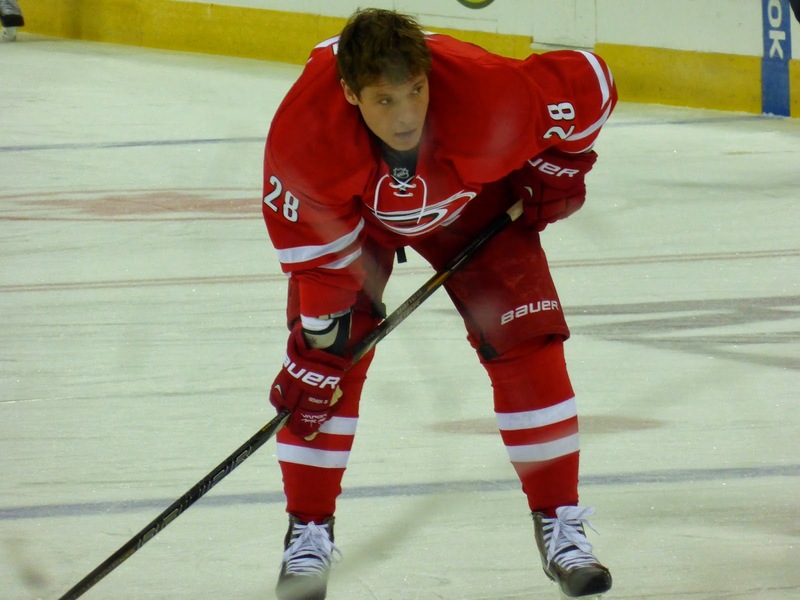 He should have been a star, but the biased local media gave all three to Carolina, with Semin (below) grabbing the first star. Skinner set a franchise record with 13 shots, the most by a single player in an NHL game since December 2010, when Patric Hornqvist had 14 for Nashville. For me, it was a memorable game as I've now seen all 30 active NHL venues and am just two away from entering Club 122. I look forward to my return next season as my Toronto on the Road trips continue. As always, keep checking for updates.